Submitted by Alexander Briones on Nov. 13, 2018. Original photograph by Joe Bielawa, modified by J Horton & available under Creative Commons license CC BY 2.0. This guide was first published on Aug. 31, 2017 written by Mason Hoberg and last updated by Alexander Briones on Nov. 13, 2018. With the resurgence of the ukulele in popular music, more and more of this compact instrument are flooding the market, making it confusing for people who are trying to buy. This is where we come in with our recommendations, featuring only the best concert ukuleles, based on the most current actual user feedback data - up to November of 2018. We've also included an informative breakdown of what you should look for in concert ukuleles, and ukuleles in general, in case you want to hunt one that's not included in the list. 94 out of 100. Incorporating 500+ ratings and reviews. While not as visually impressive as more expensive instruments, the Donner DUC-1 is good enough for beginners looking for a functional entry-level concert sized ukulele. It sports a mahogany body (laminate) and neck, and it features a rosewood bridge and fingerboard. The mahogany used in this instrument gives it a warm tone, though it does lack the volume you’d find in an all-solid instrument. It isn’t bad enough to dissuade a beginner from practicing, but it probably wouldn’t be the best choice if you’re looking for an instrument you can record with. Something that separates this uke from those that are in a lower price tier is that it actually comes with geared tuners, as opposed to the cheaper tuners you find on most sub-$40 instruments. And this is reflected in reviews, with many appreciating its overall build quality. especially when compared to others in the same price range. 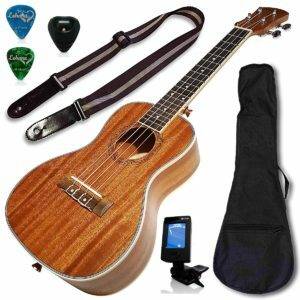 Another cool thing about this uke is that when you buy it you get all of the key accessories you’ll need as a beginner. The package includes: a strap, an extra set of strings, as well as a digital clip-on tuner. Its unreasonable to expect premium quality wood and aesthetics in this price range, but there are still a few who feel that overall quality is lacking. There are some reports of cosmetic issues, while others are wary of its structural stability. Still, for the price, the Donner DUC-1 is a very affordable way for anyone to get into the ukulele hype. The Hola! Music HM-124MG+ Deluxe is another affordable ukulele that's getting the approval of most of its users. Thanks to its sound and build quality, which includes having bone nut and saddle, something that's not usually seen in its price range. Many companies use plastic saddle and nut (the little white parts the strings pass over), and since it isn’t as dense as bone, they don't resonate as well. Resulting in noticeable difference in volume and clarity when compared to a similarly built instrument with a plastic nut and saddle. The Hola HM-124MG+ features an all mahogany body which helps give it a slightly warmer (if unfocused when compared to spruce) tone. It’s ideal for accompanying a vocalist, because the warm tone blends well with the voice. The package comes with the instrument, a few picks, a padded gig bag, as well as a strap. Most of the positive reviews are from beginners and students, or someone representing them like their parents. And many of them point to its good build and sound quality as its best asset. Given the price point, it is not reasonable to expect it to satisfy the needs of experienced players, but it continues to put a smile on the faces of its intended entry-level market buyers. There are a few reports of intonation issues at the higher frets, while others are nitpick on minor aesthetic flaws. All in all, the Hola! Music HM-124MG+ is a reliable and affordable ukulele that most will appreciate. The Donner DUC-3 is a viable option if you’re looking for an entry-level uke that won’t break the bank. It is outfitted with a laminate spruce top and laminated mahogany back and sides, geared tuners, and a rosewood bridge and fingerboard. While the instrument probably won’t be loud enough to play unamplified in an ensemble setting, it will likely cut through a mix better. The reason for this is that the spruce gives it a brighter tone (more treble), which will help it be heard above mid and low-range (guitar and bass guitar respectively) in a recording. Lastly, the Donner DUC-3 comes with a gig bag, an extra set of strings, a strap, and a clip on digital tuner. The cool thing about this uke is that while it is intended for beginners it’s generally considered to have a pretty musical tone. It’s described as being both warm and focused, which is likely due to the combination of its spruce top and mahogany back and sides. While there aren't that many complaints about the Uke itself, there are some who gave it slightly lower ratings because of the condition of its factory installed strings and the bundled strap. The Donner DUC-3 sounds more expensive than it actually is, making it very easy to recommend in its price range. 97 out of 100. Incorporating 1900+ ratings and reviews. The main feature of the Lohanu that differentiates it from similarly price concert ukuleles is that it’s made from laminated Sapele as opposed to the more traditional mahogany. While Sapele isn’t as widely used as other tonewoods, it actually has a tone that’s really similar to mahogany. However, there is a subtle difference between the two, with Sapele having a stronger high-end response. This doesn’t have as much of an impact when Sapele is only used on the back and sides of an instrument, but there is a noticeable difference when Sapele is used on the top. The use of Sapele in this uke gives it a bright character, but it won’t be as trebly as spruce, and it also won’t sound as thin. Another interesting feature of this uke is that it actually has a slightly arched back. When you arch an instrument’s back it helps to direct the tone outwards further, resulting in improved sound projection. The hardware of the Lohanu LU-C seems to be in line with what one would expect from a uke in this price range. The bound body and fretboard is a nice addition, as are the pre-installed strap buttons. The uke also comes with: a gig bag, an extra set of strings, picks, and a tuner. Value for money is a common theme among the many positive reviews that the Lohanu LU-C continues to gather. Many are happy with how its sounds, while others commend its playing feel, which many describe as comfortable. The usual issues that plague cheap stringed instruments are present, which include minor cosmetic inconsistencies and the use of cheap strings and accessories. Having said all that, the Lohanu LU-C's reputation makes it very viable for those who are looking to buy a budget friendly entry to mid-tier level ukulele. Luna Guitars are known for their innovative designs and affordable instruments, a design philosophy that is well reflected in the Luna Guitars Maluhia Concert Ukulele. The Maluhia Concert features a striking peace symbol sound hole as well as laser etchings of the word piece in different languages across the top of the instrument. As far as materials are concerned, the Luna Maluhia is representative of what you’d expect from a ukulele in this price range. The uke comes with an all mahogany body, giving it a warm tone. It also comes with a rosewood fingerboard and bridge. The only possible concern in this department is that the uke ships with a graphite nut as opposed to bone. Lastly, the Luna Maluhia comes with a padded gig bag, an extra set of strings, a polishing cloth, as well as a digital tuner. When it comes to tone, the general consensus is that the Luna Maluhia performs admirably for its price range. And since its from Luna, you can expect eye-catching aesthetics that many users appreciate. But it's not just about looks, because most of the users are pleased with how it sounds, some describing it as sweeter sounding. There are reports of build quality issues like chips and dents, but they are the minority. There are also some reports of minor cosmetic issues. Check out the Luna Maluhia if you are looking for a distinct looking ukulele, or if you are into Luna's eclectic aesthetics. First thing you'll notice about the Kala KA-PWC Pacific is its walnut top, back and sides, which give it a very earthy and unique look. In addition to giving it a distinct appearance, the use of walnut tonewood also gives the instrument a distinct voicing, described as crisp and focused. This uke also comes with subtle cosmetic appointments that include body binding to enhance its overall look. Other features include chrome open-gear tuners, and it comes strung with premium Aquila Nylgut strings. The Kala KA-PWC Pacific gets the attention of users with its combination of killer looks and great tone. 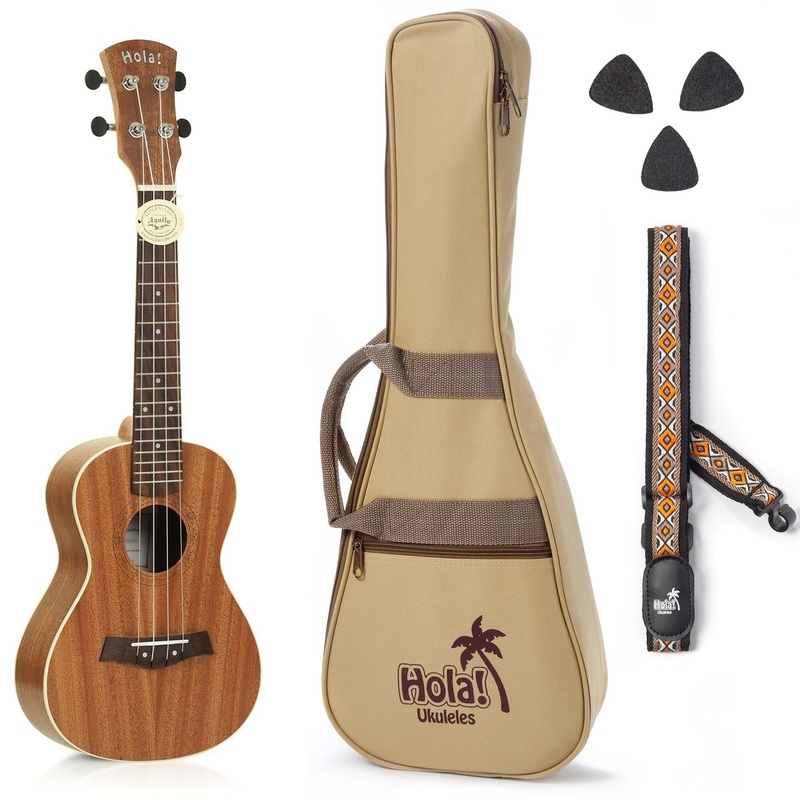 Many owners love how it easily stands out from their other ukuleles and stringed instruments. Most users also appreciate the sound, which some describe as bright and clear. It also gets a lot of thumbs up from users who are happy with its build quality, including its intonation. While many appreciate its brighter tone, there are a few who fee that it sounds too trebly at times. With its distinct appearance and tone, the Kala KA-PWC Pacific is a true standout in the ukulele market. Do yourself a favor and check it out. The Kmise Hawaii gives you quite the bang for your buck, with a concert size body that sports a solid spruce top, something that you don't usually find in sub $100 stringed instruments. In addition, it comes with built in active electronics, for plugging into an amplifier or PA system, making this affordable ukulele a stage ready instrument. If that's not enough, the built-in preamp comes with 3-band EQ and a tuner, which are essential for helping you sound good, be it while practicing or during performance. Another cool feature of this ukulele is the use of bone instead of plastic for the nut and saddle. While it is primarily marketed for its impressive feature set, most owners are quicker to commend its aesthetic appeal. Still, there are many who are impressed with its overall quality and value for money. There are a few complaints about tuning and intonation, but even those who put lower scores have mostly good things to say about the Kmise Hawaii. The Kmise Solid Spruce Hawaii is a great bang per buck ukulele that will appeal to the budget conscious. Since mahogany body ukes are quite popular, it only makes sense for a company like Kala to produce one with built-in electronics, and that is precisely what the KA-CE is all about. It features an all mahogany body with built in Shadow Active Nano-Flex preamp with EQ system. Another cool feature is the its GraphTech NuBone nut and saddle. Based on reviews, playability and tone are two of its strongest attributes. Many also appreciate its simple yet elegant visuals, while others are impressed with its built-in Nano-flex preamp. There are a few who complained about tuning stability, but there are more who find that it gets the job done. If you're looking for an affordable acoustic-electric mahogany uke, then the Kala KA-CE is ideal for you. The Luna High-Tide Koa Concert Acoustic-Electric Ukulele sports a solid koa top, which is a step up from what most are offering. Koa is known for its distinct aesthetic appeal and tone, both of which have made it a favorite of many musicians. And as expected from a Luna Guitars instrument, this one comes with cosmetic details that up its overall look further. On top of all that, this ukulele comes with built-in active electronics, with a preamp that allows you to sculpt your tone. Lastly, the instrument does come with a gig bag. Thanks to Luna's eccentric designs, the High-Tide Koa easily stands out from among what other brands have to offer. And this unique look continues to gather compliments from its owners. Tone quality also gets a lot of thumbs up, with some describing it as being very clear sounding. There are some complaints about the bundled case, while others report having to tune the instrument a bit more often than what how they expected. If you want a ukulele that will turn heads on stage, then do check out the Luna High-Tide Koa. If you’re looking for the best concert ukulele for your situation, there are a few things you’re going to need to know. If after reading through the recommendations above you’re still not sure which uke is right for you, or if you skipped through the recommendations to learn more, check out the sections below. We’ve laid out some information that will give you all the information you need to make in informed purchase. There are three commonly found ukulele sizes which have that traditional ukulele size. They are, ordered from smallest to largest: soprano (21” scale), concert (23” scale), and tenor (26” scale). The smaller the uke the thinner and brighter the sound, with the inverse being true of larger ukuleles. The concert uke is a middle ground between the soprano and tenor, having the almost plinky tone of the former with the warmth of the latter. The concert body size is the most flexible body size if you’re looking for a traditional ukulele tone. It has plenty of volume, but it also has a traditional sound. Tonewood is kind of a contentious subject, because a lot of the differences between how one species of wood’s tone compares to another is subjective. The objective fact is that no one quality tonewood (this excludes things like white wood and NATO) are objectively superior to one another. Below is a list of some more commonly found tonewoods, though as implied by the heading don’t consider this a definitive word on the subject. Mahogany is a warm sounding tonewood, commonly used in ukuleles. It has a strong representation in the low end, decent mids, and glassy (though understated) highs. Koa has a similar response. Spruce is very high-end focused, with a bright tone with plenty of punch. It can sound a bit brittle at times, depending on the body size and the other woods used in an instrument’s construction. Cedar is warmer than both spruce and mahogany, and is described as being very bass heavy. Great if you’re looking for a soft-sounding instrument, though it does lack some punch. Rosewood is a mid-range focused wood, great if you’re looking for clarity and volume. It does a phenomenal job of cutting through a mix, though like spruce it can sometimes sound brittle. Maple, like rosewood, is renowned for its clarity. It’s similar to rosewood, but brighter. When used in a well-built instrument it’s arguably going to be one of the most defined instruments in a mix. Something a lot of beginning musicians don’t know is that the wood used in instruments falls into two categories, laminate and solid. Laminate wood is thin pieces of wood glued together, while solid wood is literally a solid piece of wood. Laminate wood doesn’t resonate as well as a solid wood, so it has a lower representation of frequencies as well as less volume. Solid wood is louder and in virtually every situation will sound better. A term you’re going to hear thrown around while you’re looking for a uke is, “acoustic-electric.” Put simply, an acoustic-electric instrument is an acoustic instrument with a pickup in it (which allows it to be amplified). When you’re not using the pickup the instrument still has a good acoustic tone, but you also have the option to easily amplify it. With that being said, there is a tradeoff inherent to getting an acoustic-electric instrument. When you get an instrument with a pickup in it you’re paying for the pickup in addition to the instrument itself, so you’ll get less acoustic tone relative to the money you put in. If you’re pretty sure you’re never going to play live, an instrument without a pickup may be the better option. Likewise, if you’re planning on gigging regularly you’re definitely going to want an acoustic-electric instrument. We looked at all the concert ukuleles available from major American music gear retailers and selected 44 of them for closer analysis - you can see them in the Music Gear Database. For this 2018 update, we collated over 6000 of the most recent and relevant reviews, ratings and comments - and processed those data with the Gearank Algorithm to produce Gearank scores out of 100 for each of them. Finally, we selected the highest rated ukes in each price tier to recommend above. For more information about this process see How Gearank Works. Submitted by Jason Horton on Nov. 21, 2018.